How to protect and encrypt my email client with a password? You use a computer at home and another at your office and you want to use the same email client on both without losing messages. The only solution is to set up your email client on a portable drive (USB stick, iPod... ). You carry only your portable drive from your home to your office. You can connect your portable drive on the computer in your home or your office and use the same email client on both computers. But then appears a risk of losing or being robbed of the portable drive. You regularly save a backup of your portable drive on a computer but it is very important that this portable drive is protected so that the thief or the person who finds the drive can not access your email client. This can be done using a portable application installed on this disk and protected by WinSesame. This tutorial is based on the use of a portable application email protected by WinSesame. It lets you set up your email client on an external drive or a portable USB memory stick while protecting content against unauthorized access in case of theft or loss of support. What if the disk is lost? What if the disk is stolen? All these problems can be handled with ease if encryption software is used to protect the portable app. A portable email application as Thunderbird portable edition. 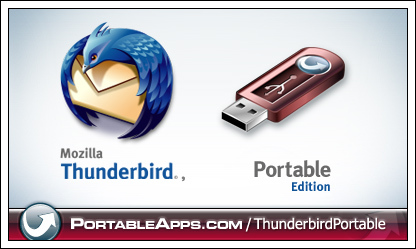 To install Thunderbird Portable, just download the portable package at this address page and then double-click it. Select the location you wish to install to (your USB drive) and click OK. A PortableThunderbird directory will be created there and all the necessary files installed. To secure your PortableThunderbird directory right click on the folder and in the context menu click WinSesame Protection. Enter the password of your choice and confirm it. In case you need to open your email client on a computer where WinSesame is not installed, save a copy of WinSesame Free downloaded there on your USB drive. You will be able to install the free version on the computer but the free version will not allow you to close your mail file on this computer. 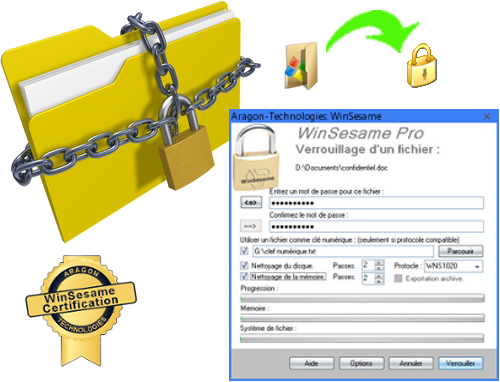 A portable version of WinSesame is planned which will allow to open and close a protected folder on a computer where WinSesame is not installed.